In today’s tech-heavy world, having an online presence as a business is nothing short of a necessity. And unlike previous decades, where “online presence” meant little beyond having a functional website with a few basic contact and product links, that means digital marketing that extends across several distinctly different online mediums. At SEO Werkz, we’re here to help. We have you covered in a full range of digital marketing services, from web design and layout to SEO, PPC and more. We’ve realized in our years in this industry that many businesses are not fully aware of the benefits of a diverse digital marketing portfolio, or simply don’t know how to achieve one – particularly when it comes to SEO. 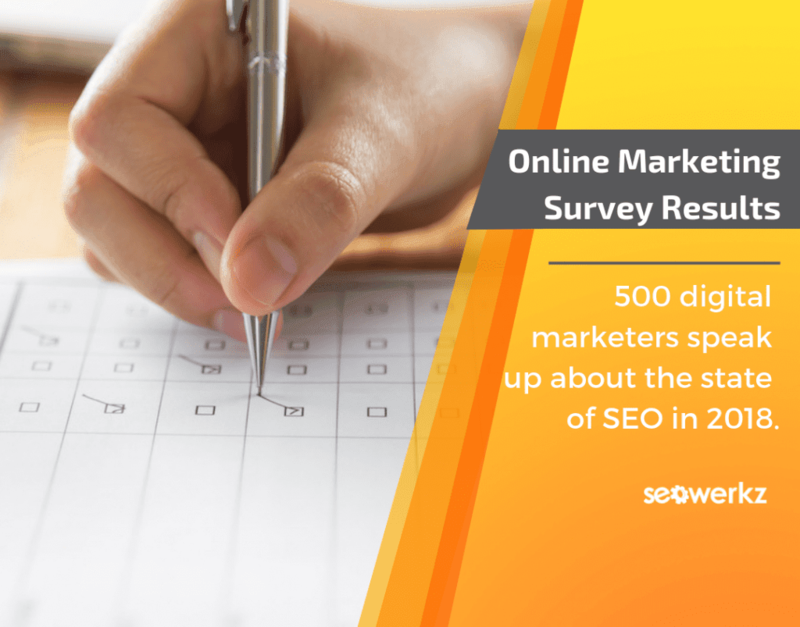 In part one of this two-part blog series, let’s look at a recent study by Clutch that surveyed over 500 digital marketers across the country and see what it said about basic online marketing and why SEO isn’t being utilized by enough businesses. Three channels make up the most popular formats for businesses marketing themselves online: Social media marketing (81 percent of businesses use it), standard websites (78 percent of businesses) and email marketing (69 percent of businesses). The primary goal of digital marketing across all channels for 2018 is to increase sales and revenue. Larger companies tend to use digital marketing to separate themselves from the competition, while smaller companies tend to use it to improve general awareness for their brand. Over 80 percent of businesses believe their digital marketing programs are effective in moving them toward their business goals. Only 44 percent of businesses invest in SEO, making it the least popular channel available. One major finding from Clutch’s study, and one that shouldn’t surprise professionals in the internet marketing industry: Diversifying your digital marketing channels is vital, and more and more businesses are coming around to this basic reality. We noted social media, websites and email marketing as the three most well-used mediums above – this is largely due to the fact that these are direct methods of reaching customers, plus they allow brands to tell stories and shape narratives about products or services. There are other important channels as well, however, including display and search ads, content marketing, and mobile apps. Using each of these in coordination with the overall project goals is the name of the game for smart marketers; our pros can help you understand how each channel will benefit you and which you should prioritize. Why is SEO Less Popular? Lack of knowledge: Many business owners and even digital marketers simply don’t understand how SEO works, or how it plays a role in other channels as well. They don’t understand that even areas like social media or email marketing tie into SEO in direct ways – you’re likely affecting your brand’s SEO even if you aren’t actively looking at it, so it makes sense to pay attention. Delayed results: Unlike social media or basic website marketing, SEO generally doesn’t produce immediate gratification. It takes time to make its full impact, slowly and steadily increasing site traffic and conversion rates through the use of keywords, content and the right promotion. For more on why SEO is an underutilized tool for many businesses, or to learn about any of our online marketing services and how we can help, speak to the pros at SEO Werkz today.